Not everything I cook is on the BGE. Sometimes I cook inside, just not very often. For some reason, I got a hankering for some sloppy joes yesterday. We didn’t get them a lot growing up as my Dad was not a fan. When we did get them, I’m pretty sure my Mom made them from one of those spice packets. Nothing wrong with that, but last night, I wanted to try to make a home made version. After looking around the net for a while, I decided to try Rachel Ray’s. Not sure why. I’ve never cooked any of her recipes. And truth be told, I’m not a big fan. She kinda annoys me. Too happy and waves her arms and hands around way too much, but I digress. Here is the recipe with a few modifications I made. Heat a large skillet over medium high heat. Spread the meat around the pan and begin to break it up. Combine brown sugar and steak seasoning. Add sugar and spice mixture to the skillet and combine. When the meat has browned, add onion and red peppers to the skillet. Reduce heat to medium and cook onions, peppers, red wine vinegar and Worcestershire sauce with meat for 5 minutes. Add tomato sauce and paste to pan. Stir to combine. Reduce heat to simmer and cook Sloppy Joe mixture 5 minutes longer (I let it simmer about 15 minutes). Using a large spoon or ice cream scoop, pile sloppy meat onto toasted, buttered bun bottoms and cover with bun tops. Serve with your favorite sides or sliced tomatoes seasoned with salt and pepper. Have plenty of napkins on hand! This recipe really wasn’t for me. I’m not sure who it was designed for, but I have a strong suspicion that kids palettes heavily influenced it. I think the combination of the sugar and the red peppers made it too sweet. I would definitely cut back on both. Speaking of kids, I’m not sure most kids would like the onions and peppers in their joes, especially not picky eaters. I know I wouldn’t have as a kid. One last thing about the onions and peppers and then we’ll move on. 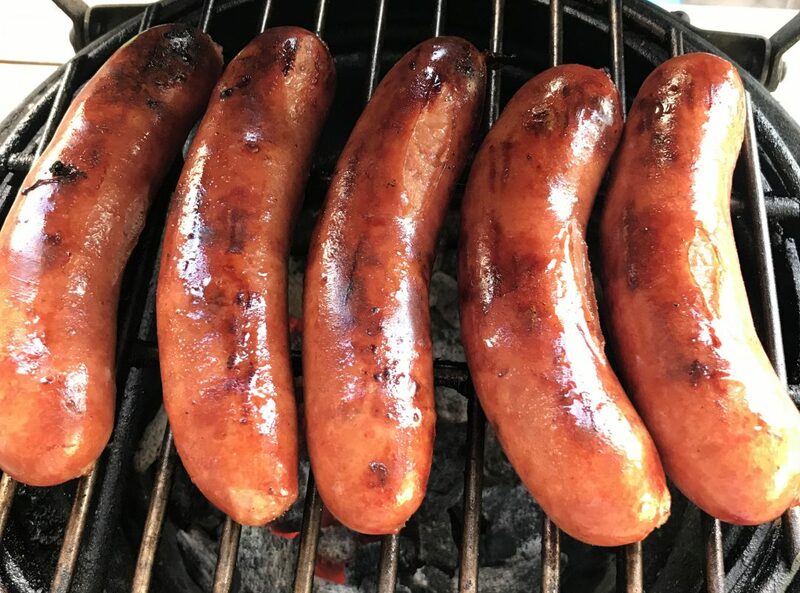 Adding them after browning the meat? That just sounds weird to me. Usually you soften the onions and peppers in a recipe by sautéing them first. Maybe that’s just me. I thought the sloppy joes were underseasoned as well. When was the last time you saw a recipe that did not have salt and pepper in it? I had to add both. Come to think of it…no garlic? I think that would have helped. The hot sauce wasn’t in her original recipe, but I like things to have a little kick and thought it might offset the sweetness of the recipe (it did, but not enough). Usually, I just use plain ole hamburger buns for sloppy joes. While at the store yesterday, I spotted a package of telera rolls. These are the rolls used to make tortas (a Mexican sandwich). I went back and forth between these and hamburger buns and finally got the telera rolls. I lightly toasted them before making my joes. I think they held up better than hamburger buns. If you have access to telera rolls in your neck of the woods, I’d recommend trying them. All that being said, it wasn’t totally bad. Better than the season packets you can buy. 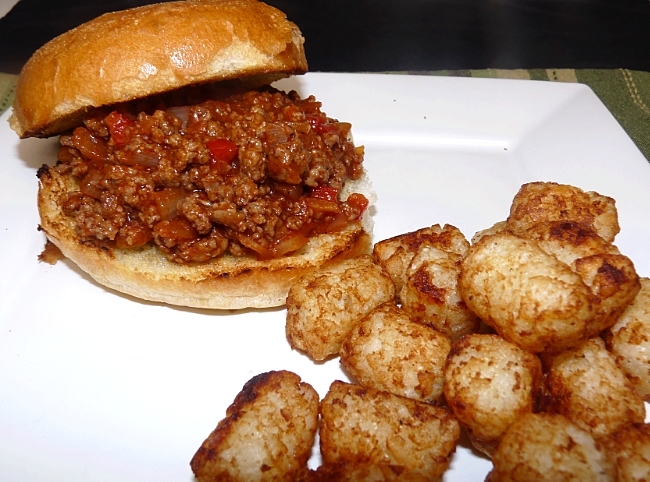 If you like your sloppy joes on the sweet side, this might just be your recipe. As for me? I think it makes a good base line recipe to work with. I’ll tweak it until I get it right. Less sugar, more heat, salt and pepper and some garlic and we’ll be heading in the right direction. Grif do you know what these ping backs are? No. What are you talking about? Where are you seeing them? My Mom used to make them every couple of weeks for my brother and I, quick easy meal for a single Mom with two appetite demanding kids. Just basic Manwich but we loved them and they were usually served with Tots like you posted. The really sad part is my wife is not a fan and it rarely (never) makes it into the rotation. Thanks for the good memories though. FYI – I think I used the Manwich stuff in a can. Dad actually ate turkey sloppy joes at a fellowship dinner Wednesday night. Didn’t have much choice!! And he survived! Manwich, huh? Never knew that, Mom. Maybe that’s why mine never tasted like yours. I’ve always used those spice packets. McCormick’s I think they are. Gald to know he lived. I too have had a hankering for some of these loose meat sandwiches, for like a month now. I should do something about it. I get why you didn’t do it on the BGE, but man, I bet some smokey flavor in these sandwiches would be good. You’ll have to figure out a way to adapt it for the smoker. My mom always used Manwich too. It was good. Sloppy joe, slop sloppy joe!